Britain's Johanna Konta reached the last 16 at the Wuhan Open in China after Victoria Azarenka retired with a leg injury in round two. The 24-year-old Briton led 6-4 1-0 when former world number one Azarenka decided she could not continue. Konta, the world number 66, will replace Heather Watson as British number one in next week's rankings. 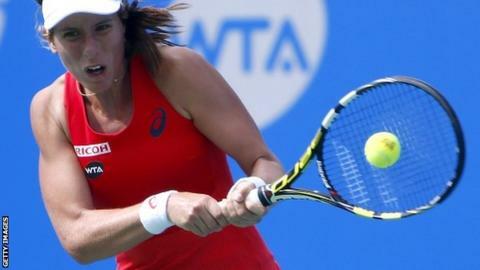 She came through two rounds of qualifying in Wuhan, joining 19 of the world's top 20 in the main draw. Konta will play Romanian top seed Simona Halep in round three, after the world number two beat Russia's Anastasia Pavlyuchenkova 6-2 6-1. Her opponent might have been struggling physically, but Konta was again in the kind of form that has seen her rocket from 126th in the rankings to 66th within three months. Azarenka had spoken about her leg issue after her first-round match and the Belarusian was clearly hampered as two double-faults handed Konta an opening service break. The Briton did not require much help, however, playing with the confidence that comes from a superb run of form as she fended off two break-back points on her way to serving out the set. Azarenka had her left thigh heavily strapped during a medical time-out, but two flowing winners helped Konta break at the start of the second set and prompted her opponent to call it a day. "I was happy with the things that I was able to control," said Konta. "I'm not in control of how she's feeling and what she's going to do but I can control how I react to things, and I thought I did quite well with that." Konta began the year ranked 150th, exactly 100 places below Watson, but she will pass her compatriot in next week's rankings. Watson is currently ranked 60th in the world. "It's obviously nice to hear but it's not something that I actively think about or spend much time on to be honest," said Konta, who could break the top 50 with another win on Wednesday. Seven-time Grand Slam champion Venus Williams earned the 700th victory of her career with a 6-4 6-3 win over German qualifier Julia Goerges. The 35-year-old American became the ninth woman to reach that mark since tennis turned professional in 1968. "I'm glad nobody told me before, I would have been a little bit nervous," said Williams. Third seed Petra Kvitova of the Czech Republic edged past Russian Daria Gavrilova (Russia) 6-3 4-6 7-5, but in-form Swiss 11th seed Belinda Bencic retired against Italy's Camila Giorgi with a leg injury.